In the extremely detailed plan, the TV show host even roped in LA Galaxy president Chris Klein, and had comedian Maz Jobrani imitate the real sculptor Omri Amrany. 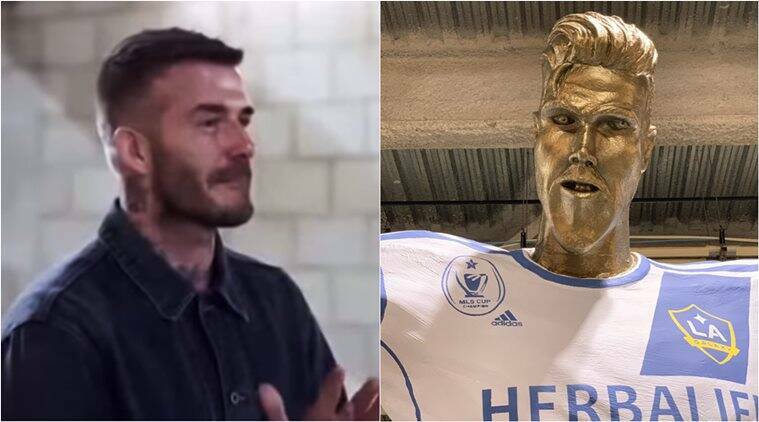 The props team created the fake statue to pull off an epic prank on David Beckham and he fell for it! Footballers aren’t unused to having unusual sculptures of themselves. Just ask Juventus striker Cristiano Ronaldo or Liverpool’s Egyptian star Mohammed Salah. Despite that, when a statue of David Beckham was unveiled before the English football star, he was stupified. The statue, which was meant to honour his career at US club LA Galaxy, looked nothing like the footballer and had a long face, a disproportionately large chin, three teeth and deep-set eyes! Luckily, for Beckham, it was just a prank. James Corden, the TV host of The Late Late Show revealed the epic prank on the footballer in Monday’s episode, in which Beckham was led to believe that the grotesque statue was to be unveiled in his honour before the Major League Soccer (MLS) club’s season-opener. Beckham played in Los Angeles from 2007 to 2012. However, Corden decided to pull the former Real Madrid midfielder’s leg by switching out the real statue with a fake one, and Beckham’s reaction was priceless. To pull off the prank, Corden’s team created a sculpture that was both “realistic” and “absolutely terrible.” After two months of hard work, the team brought the fake statue to Dignity Health Sports Park in California to unveil it before Beckham. In the extremely detailed plan, the TV show host even roped in LA Galaxy president Chris Klein, and had comedian Maz Jobrani imitate the real sculptor Omri Amrany. So while others applauded as it was unveiled, Beckham appeared shocked. The footballer called the sculpture “embarrassing” and kept arguing with the ‘sculptor’ that it looked nothing like him. Finally, Corden reveals it is a prank, and even got a hug from Beckham. The prank left people in splits online.